Are tunnels a kind of bridge? Because of the hilly terrain there are quite a few tunnels in Marin County. The photo above shows the 2350 ft long Cronkhite (Bunker Road) Tunnel (27 0039). 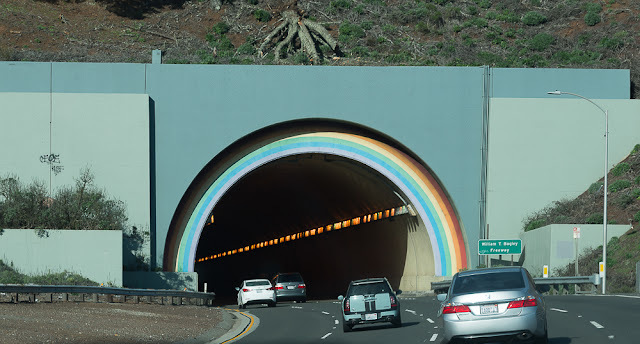 It was built in 1917 and carries traffic under US 101 to and from the Marin Headlands (the southern tip of Marin County). It's just wide enough for a single traffic lane so cars (but not bikes) have to wait 5 minutes for the light to turn green on each end of the tunnel. The nearby Waldo Tunnels (27 0040L/R) are 1000 ft long and were built in 1937 and 1954. Since they carry busy US 101, they consist of two parallel 4 lane tunnels to and from the Golden Gate Bridge (shown above). Marin County is big on bicycles and so there are several bicycle routes for commuters. I rode on the Cal Park Hill Pathway which shares a 1000 ft long tunnel with the Sonoma-Marin Area Rail Transit (SMART) Line. It includes a gate that closes the bike path at midnight (shown above). There are several similar 19th century railroad tunnels that are being renovated for new passenger rail lines and bike paths. Marin County, California Bridges: Marin County Tunnels by Mark Yashinsky is licensed under a Creative Commons Attribution-NonCommercial-NoDerivatives 4.0 International License.